Here we have a Dux Proflo 125 litre Narrow Diameter electric hot water heater for sale. Dux has a new 125L in their Proflo Electric Hot Water System Range. The 125X136 features a narrow diameter compared to the standard Dux Proflo 125 litre (model number: 125T136). 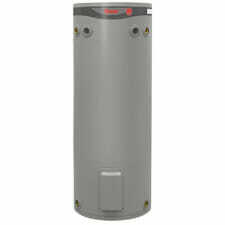 The 125X136 is a slimmer and taller hot water heater (dimensions below). *Additional element size available. Also available 1.8kw. This needs to be specially ordered so please phone to organise.